The Cycloboost/AEVON electric bike trailer is a new addition to the e-trailer world with the ability to carry a lot of cargo on or off road for potentially long distances! Electric bicycle trailers are handy if you have a traditional bike that you would like to add electric assist to now and then. Ridekick is one of the early pioneers of electric trailers. Tour Guides: ride with customers and carry their stuff! Here is a video of the Cycloboost trailer in action! The Cycloboost electric trailer offers a few different power options: 250 watt, 750 watt, and a 1,000 watt version. The trailers use either a 36 Volt or a 48 Volt lithium ion battery with a few different amp hour options; 10ah, 15ah, and 20 ah. Speeds vary from 12.5 mph (20 km/h) to 28 mph (45 km/h) depending on which power option is used and if you are pedaling. Range varies from 25 miles (40 km) to 62 miles (100 km) depending on which size of battery is used and how much you pedal. Adding assist is handled either by a throttle or pedelec (pedal assist) option. If you have 2 bikes that you want to use the trailer with you can buy an extra throttle or pedelec kit to make installation of the trailer quick. The AEVON trailers are constructed from large aluminium tubing and it looks like they can handle some rough on and off road riding. The trailer mounts at the seatpost which provides stability and the ability to make tight turns. The trailer can handle quiet a bit of cargo and the bag itself is waterproof. There are different sizes of cargo bag: 4,880 in^3 (80 liters), 6,100 in^3 (100 liters), and 7,300 in^3 (120 liters). The weight limits are 77 lbs (35 kg) or 100 lbs (45 kg) depending on the trailer used. To make the ride smoother for the cargo, the Cycloboost/AEVON trailer has rear suspension too! There is a rear wheel swing arm with an air/oil shock to help the trailer track over rough terrain. 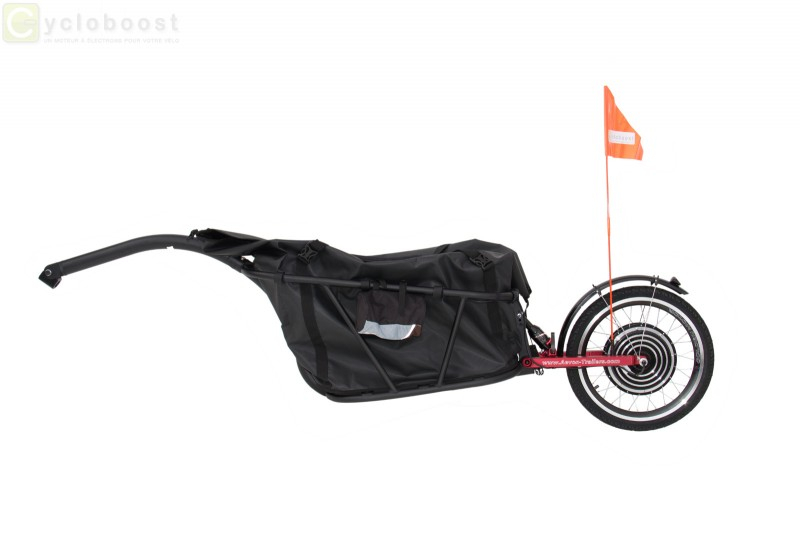 Find out more about the Cycloboost electric bike trailer here. I wonder how these trailers compare to the RideKick made in Fort Collins, CO? They both seem like good options for people who occasionally want an electric boost w/out an electric bike. Too bad the Aevon website doesn’t have an option for English translation. They look like an interesting company. I like the one wheel bob design. I wonder if this will fit a bike with 700cc wheels and if the hub motor spins free during coasting or if battery fails. Also, the website is in French. How do I buy from USA? That speed given in the video translates as 13-18 MPH which while not much it beats walking all to heck. Also I wonder about the load capacity of the KW trailer.